​To maintain genetic integrity, eukaryotic cells must segregate their duplicated chromosomes to their daughter cells with high fidelity during mitosis. The unravelling of the mechanisms ensuring proper chromosome segregation should improve our understanding of various human diseases such as cancers and congenital disorders, which are characterized by chromosome instability and aneuploidy. Kinetochores are large protein complexes formed at the centromere regions of chromosomes. For high-fidelity chromosome segregation, kinetochores must be properly caught on the mitotic spindle (reviewed in Tanaka TU, 2010). We have found that kinetochores initially interact with the lateral surface of a single microtubule extending from a spindle pole (Figure 1, step 2; Tanaka K et al, 2005, Kitamura et al, 2007); this process is often facilitated by microtubules generated at kinetochores (Figure 1, step 1; Kitamura et al, 2010; Vasileva et al, 2017). Subsequently kinetochores are tethered at the microtubule plus ends (Figure 1, step 3; Figure 2; Tanaka K et al, 2007; Maure et al, 2011; Kalantzaki et al 2015; Yue et al 2017). When this process fails, a failsafe mechanism prevents kinetochore detachment from a microtubule (Figure 2; Gandhi et al, 2011). Following the initial interaction with microtubules, sister kinetochores must interact with microtubules extending from opposite spindle poles (sister kinetochore bi-orientation) before anaphase onset. If this interaction occurs with aberrant orientation (Figure 1, step 4), such errors must be corrected by turnover of the kinetochore–microtubule attachment (error correction; Figure 1, step 5). We have found that Aurora B/Ipl1 kinase and other factors have crucial roles in this process (Figure 3; Tanaka TU et al 2002; Dewar et al, 2004; Maure et al, 2007; Kalantzaki et al 2015). Once bi-orientation is established and tension is applied across sister kinetochores, kinetochore–microtubule interaction is stabilized (Figure 1, step 6; Keating et al, 2009). Sister chromatid cohesion around centromeres plays important roles in this process (Natsume et al, 2013; Tanaka TU et al, 2013). We are investigating these mechanisms in more detail in vivo in yeast and also by reconstituting kinetochore–microtubule interaction in vitro, and by extending our study from yeast to human cells. ​Figure 1. The figure illustrates step-wise development of kinetochore–microtubule interactions in mitosis (prometaphase [steps 1-5] and metaphase [step 6]) (reviewed in Tanaka TU 2010). ​Figure 2. Molecular mechanisms involved in kinetochore tethering at the microtubule end (Maure et al, 2011; Kalantzaki et al, 2015) and in the failsafe procedure preventing kinetochore detachment from a microtubule (Gandhi et al, 2011). ​Figure 3. The aberrant kinetochore–microtubule attachment is removed by the action of Aurora B kinase. Aurora B differentially regulates lateral attachment and end-on attachment, which drives the error correction process (Kalantzaki et al, 2015). Duplicated chromosomes (sister chromatids) are held together by sister chromatid cohesion until chromosome segregation takes place in anaphase. Without this cohesion, there would be no way to mark a pair of sister chromatids destined for segregation. In particular, robust sister chromatid cohesion around kinetochores is crucial for this purpose. We found that this robust cohesion is facilitated by Dbf4-dependent kinase recruited to kinetochores (Figure 4; Natsume et al, 2013; Tanaka TU et al, 2013). Sister chromatid cohesion is maintained until metaphase, but it must be quickly removed from chromosomes upon anaphase onset. We have recently found a new mechanism that makes this removal efficient (Figure 5; Li et al, 2017). We are currently studying these mechanisms in more detail. ​Figure 4. Kinetochores not only promote microtubule attachment but also facilitate robust cohesion and advance replication timing of surrounding regions. Dbf4–Cdc7 kinase at kinetochores plays a central role in these processes (Natsume at al, 2013). ​Figure 5. It has been thought that cleavage of cohesin Scc1 by separase is the final step for removal of sister chromatid cohesion from chromosomes. 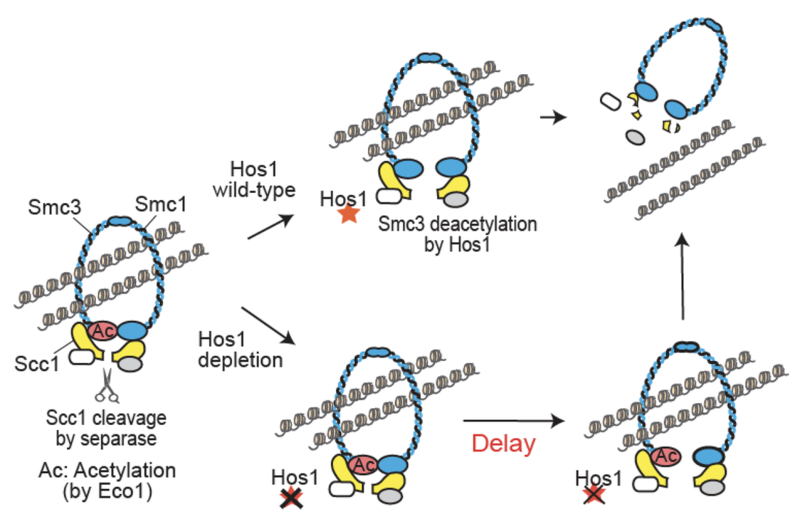 However, our recent work suggests that deacetylation of cohesin Smc3 by Hos1 is also required for efficient removal of cohesion (Li et al, 2017). Before chromosome segregation takes place, chromosomes must be duplicated properly. We have been studying how chromosome duplication is regulated in space and time within the nucleus. We have found how replication factories are formed to organize DNA replication (Kitamura et al, 2006; Saner et al, 2013) and how replication timing is regulated around centromeres (Figure 4; Natsume et al, 2013). Meanwhile, we have also been interested in evolution of the centromere. We have recently discovered a novel type of centromere in budding yeast, which sheds new light on the centromere evolution in the yeast lineage (Kobayashi et al, 2015).